gardenenvironments Thoughts on how to create a well-designed garden retreat. Many people today are concerned about where their food comes from and whether or not it has been sprayed with chemicals. One of the best ways to do this is to grow your own food. A long term investment in your food supply is to plant dwarf fruit trees. With Spring having arrived here in Durham, NC, dwarf fruit trees are also blooming right now. The added bonus of spring flowers is a hint of juicy goodness later in the year. The following is the fruit trees I have in my garden. I have two dwarf apple trees. I planted two because I have heard that apples must cross-pollinate. My trees are young therefore I have not had any fruit on them yet. Apple trees would prefer a little cooler weather than we have in this area. However, since I only planted them for my consumption and any friends I might share with, that does not concern me. If I was trying to sell enough to make a living on them then that might be an issue. I have a dwarf peach tree called Belle of Georgia. Peach tree buds can often get nipped by late freezes in this area but last year I had a great little crop of peaches. I had so many peaches that a large limb in the tree was broken by the weight. I learned my lesson there and will go into pruning fruit trees a little later in this post. 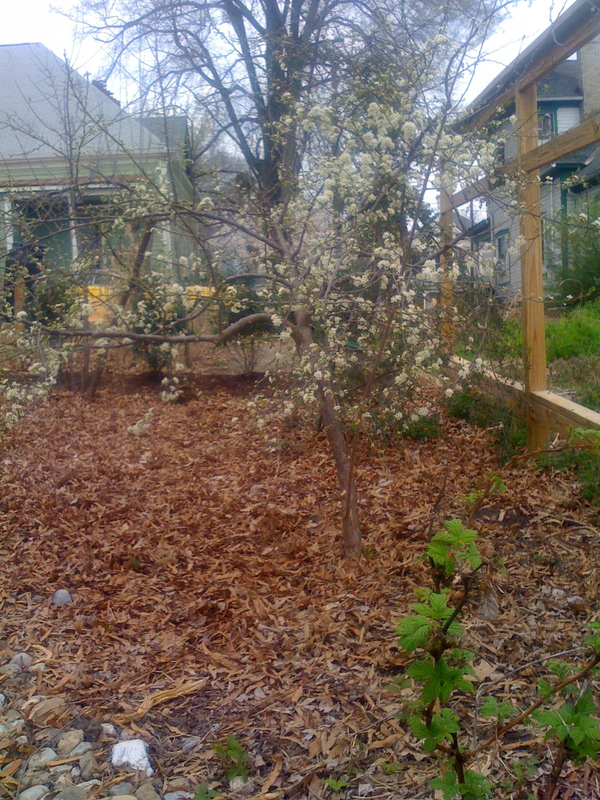 In the native garden, I have a native plum. these are naturally small trees and the plums are also small. However, they are great to snack on while enjoying the garden. I cooked some of them down into a plum sauce which was very good on baked pork chops and even some baked chicken. New trees easily pop up around the parent plant allowing you to dig them up to share. They also seem to have a tendency to send up new shoots from the roots. These must be removed if you don’t want a thicket of plum. I also have a native cherry. It has bloomed great this year. Last year I don’t remember how much it flowered but I do know I had very few cherries on it. We will see how they do this yer. I have been told that cherries also would do better in a little cooler climate as well. My view is the same as it is with the apples. One tree that I also have but will not be dwarf is a pear tree. This tree has already produced quite a few pears. However, I still haven’t eaten one because it seems the squirrels know exactly when to pick every last one off the tree before I can get them. It’s tempting to sit out there with a BB gun and reduce the squirrel population so I can enjoy some pears. Another native fruit tree that I have but you don’t see a lot of is the PawPaw tree. This is also known as the Hoosier Banana because the fruit is said to taste somewhat like a banana. These trees look a little tropical with their large leaves. Pawpaws can grow into large colonies. However for fruiting, you need to have trees from different colonies. This entry was posted on March 24, 2011 by sheldongalloway. It was filed under Durham, NC, garden design and was tagged with Buy local, chemical use, Durham NC, edible gardens, environmentally friendly landscaping, Flowering trees, fruit trees, garden design, landscape design, native gardens, native plants, natural gardens, Organic gardening, small gardens, Spring flowers.